I just started Panorama X and what I am sure is a simple task is driving me nuts. I am creating a new database for a home inventory and one of the fields is to be a photo of the inventory item. I want that to appear in the report for printing. I have read the Help menus for image display items over and over and still can’t get it to work. I am not a programmer so the references to procedures are greek to me. Any help will be greatly appreciated. The photo field can not be the actual photos but the path to them. I have a simple example of how things work in the animation below. I have a field I named Images with some paths to various pictures. There is an empty form that I drag an Image Display object onto and then in the Formula pane for that object I simply enter the Images field name. I also show a simple way to add image paths to your field by dragging them from the Finder. That’s pretty cool Gary. I hadn’t really thought of dragging the image from the Finder into the data sheet editing window like that. @sawdust, take note that no programming is required for Gary’s solution. You may also find the Image Display documentation helpful. 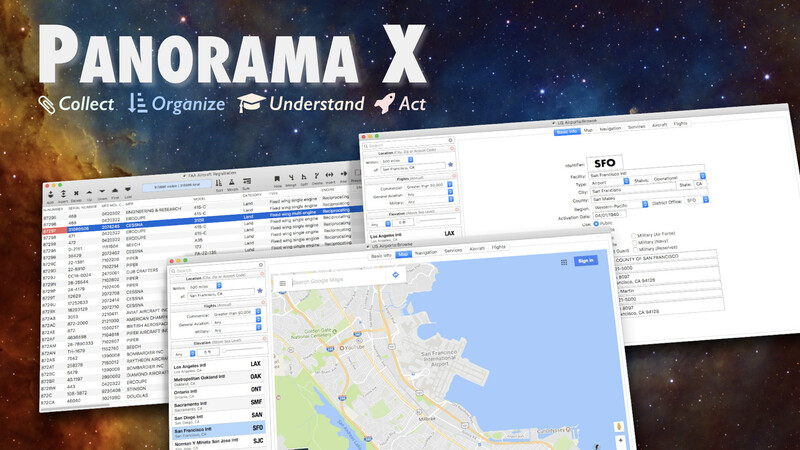 Panorama X: Is used for dynamic images (images that change depending on the data). Thanks very much… works like a charm. Sawdust, I have a similar problem with a database of furniture projects. I would like to include a photo of each piece, along with data about start/finish etc. This seems similar to your home inventory project in the issues presented. Could you elaborate on your solution? Below is the email that solved the problem for me. Hope it helps.